Tony Walsh hosting our 40th anniversary event. Tony ‘Longfella’ Walsh is one of the country’s top poets. He is known for his Manchester poem ‘This is the Place’, and his poems on topics as diverse as Blue Peter and the Lake District have been enjoyed by millions. 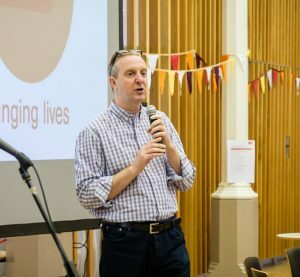 He first worked with Back on Track in 2017 when he led a series of poetry workshops with our service users, working with them to create a collaborative poem to celebrate our 40th anniversary. He has also performed his own poems at several of our events. 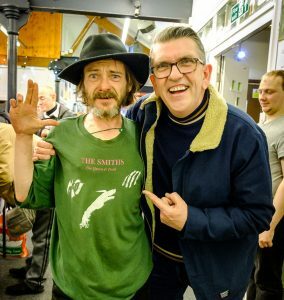 Mike with Back on Track service user (and Smiths fan) Lawrence. Mike Joyce is a drummer and DJ who formed part of the legendary Manchester band The Smiths. He has also played with big names including Buzzcocks and Sinead O’Connor. He also DJs and hosts a weekly radio show on XS Manchester 106.1FM. Mike recently featured on Granada Reports when he came to Back on Track to run a special cooking session called ‘Come Dine With Mike’! . 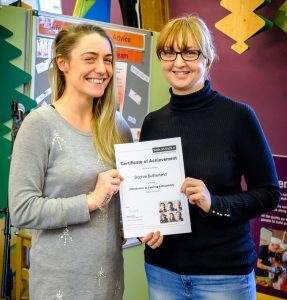 Mary-Ellen with Sophie, who had just graduated from our catering training course. Mary-Ellen is one of Manchester’s most renowned chefs, having been named Chef of the Year at the Manchester Food and Drink Awards. She shares our belief in sustainability and ethical sourcing and often works with Real Junk Food Project Manchester, the city centre cafe that aims to stamp out food waste. In 2018 she opened the Creameries in Chorlton after a successful crowdfunding campaign.